While the unicorn cake has taken the internet by storm, clear step-by-step directions are hard to find. 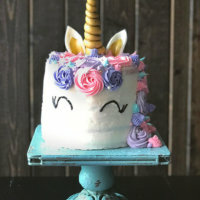 This post gives you all the detailed steps you need to learn how to make a unicorn cake with rainbow layers, even if you are all thumbs in cake decorating! I bake all of my kids’ birthday cakes every year. It’s what I do to make their day a little bit special. Sometimes it’s a simple box mix cake that I’ve kicked up a notch or two, other times it’s all homemade from top to bottom. I take each child’s special request and do my best to make something amazing for their very special day. 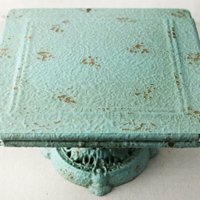 From soccer balls to batman, ice cream cakes and tiramisu, I’ve made it all (some cakes I have shown off in this post). My boys are pretty specific about the flavor of their cakes, but my daughter is all about themes. 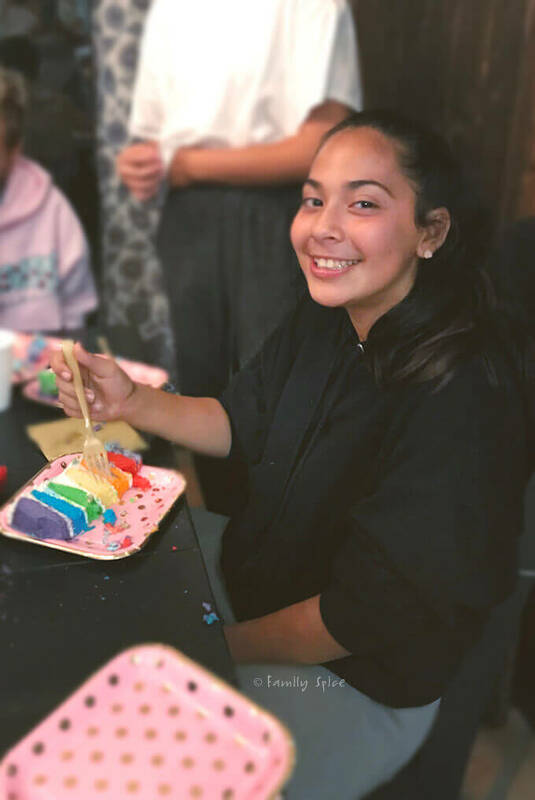 Despite her turning 13 this last October, she is still a glitter loving little girl and she requested a unicorn cake. What the F@*! is this blasted unicorn cake? So yeah, I’m a food blogger. I’ve been blogging since 2008 and I have small YouTube channel. And yeah, my daughter follows me, but she tells me I need to be more like Rosanna Pansino from Nerdy Nummies. Sigh. Well, I’m not that young anymore and I was NEVER that perky. But dang, that Rosanna has really blown up the baking scene with her creations on YouTube. And one of those infamous creations, is her unicorn cake. Basically, the cake is covered smoothly in white frosting, iced on top and down the side with colorful swirls for its mane, adorned with a golden fondant horn and ears, with iced black slits on the side of the cake for eyes. I looked at the cake, I watched the video and I thought, “Yeah, I can do that.” Rosanna made it look SO EASY. 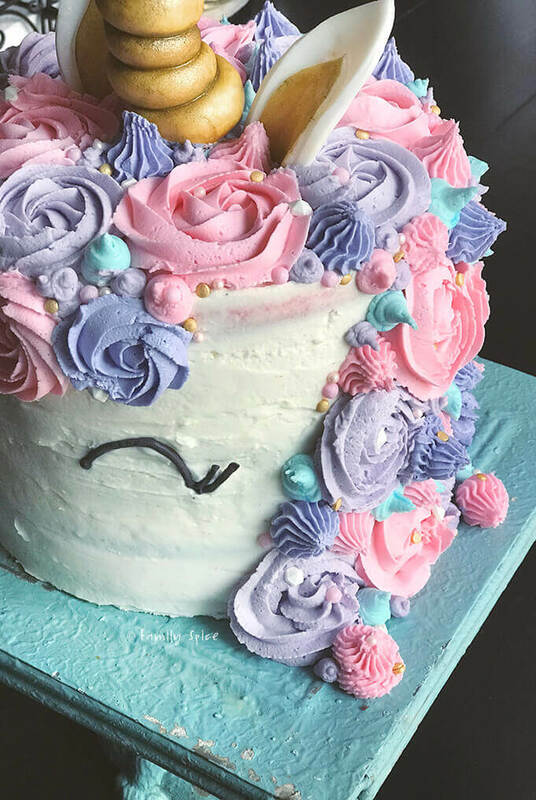 This was such a popular cake last year that it shouldn’t surprise us that Google reported that ‘Unicorn Cake’ was the most searched food for 2018. Go figure! So, how could I not make this unicorn cake? How much work is it to make a homemade unicorn cake? Yeah, google that question and see if you can find an honest answer! So depending on your icing skills and general baking skills, this unicorn cake can appear to be a daunting task. I am not a fan of the piping bag, but I think I did a decent job faking my abilities and my unicorn cake turned out pretty darn well. 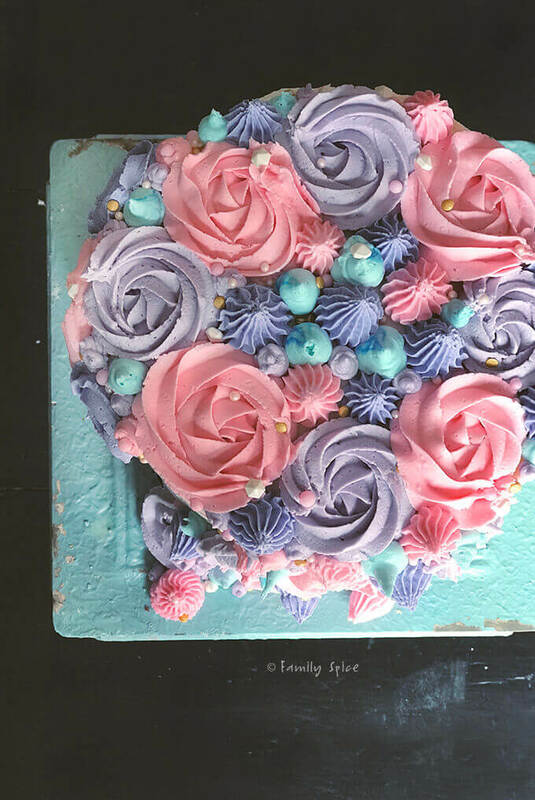 My daughter liked her cake, too – although she was quick to point out that Rosanna’s unicorn cake was MUCH more professionally decorated than mine. Sigh again. 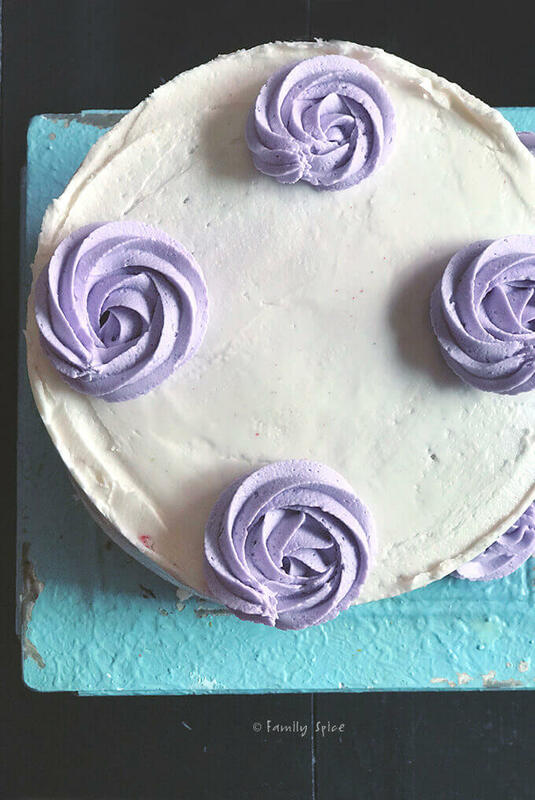 Despite my limited skills with the piping bag, if you take each step of the cake decorating process as a small feat to conquer, you can recreate this unicorn cake without completely going insane. Yes, it requires a whole lot of patience and basic hand-eye coordination. But, if you enjoy baking and decorating cakes, even as a novice, you can easily recreate this unicorn cake. It shouldn’t be a complete #pinterestfail. Not to mention you can do it at the fraction of the cost of what you pay a professional baker to create! I mean isn’t that really why we recreate this cakes at home? To impress our kids without breaking the bank! For my daughter’s cake I decided to make the interior of the cake with six layers of different colored cakes: red, orange, yellow, green, blue, purple. 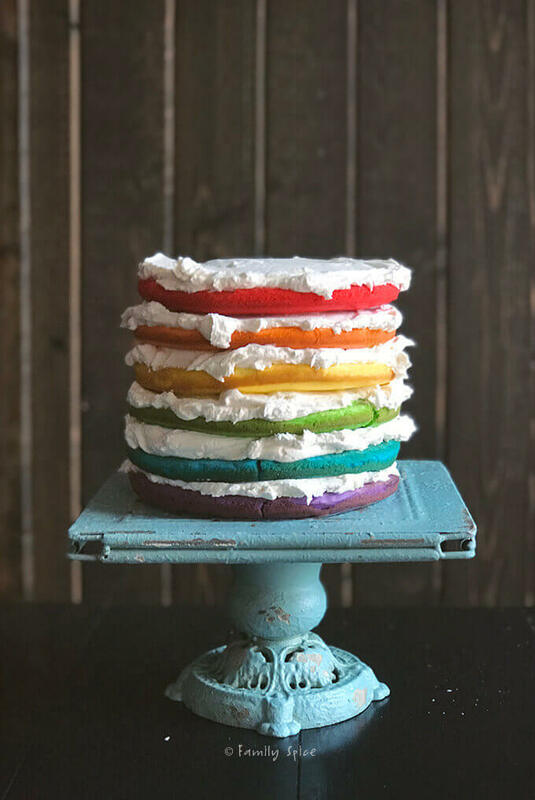 Unicorns are all about the rainbow, so what a fun surprise it would be to cut into this white frilly cake and see the rainbow inside? I used two 99¢ white cake mixes for the cake. I knew I was going to slave away on the decorating and didn’t want to stress on the cake baking. To make sure all of the layers were even, you need to divide each box mix batter into thirds. This is most easily done with a kitchen scale. 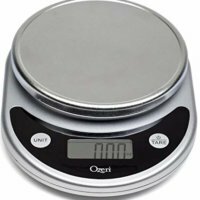 Place your empty mixing bowl on the scale first then zero out your scale. Mix up your white cake mix batter into this bowl. Once the batter is done, read the weight of the scale and divide this number by 3. I swear this is the most complicated math problem you will have to solve for this unicorn cake project! For me, the batter weighed 31.3 ounces. So, I needed two other bowls and I weighed out 10.4 ounces of batter into each of the three bowls. Remember, when weighing the batter, you need to place each bowl on the scale empty and zero out the scale before you pour in the batter. All this measuring is to insure that each layer of cake is as even as possible. Once the batter is divided into the three bowls, I added the dyes. 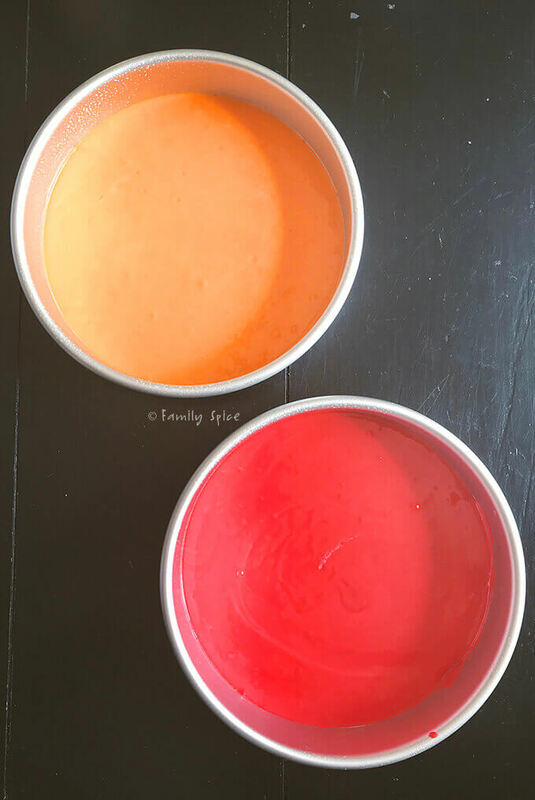 I used these food dyes from Wilton and I used their website to estimate the color recipes to get the bright colors we liked. I baked the 3 colorful cake layers in 3 8-inch cake pans lined with parchment paper. While the first three cakes were baking, I cleaned out my mixing bowl and mixed up the second box of white cake mix, divided the batter again 3 ways and colored up the last 3 cake layers. When it comes to a project like this unicorn cake, I bake the cakes the day before I decorate them. Then I decorate the cake the morning of the event. I did make the unicorn horn and ears the day before because they were made with fondant and needed to dry and harden. But I’ll get into those items, in the next section. 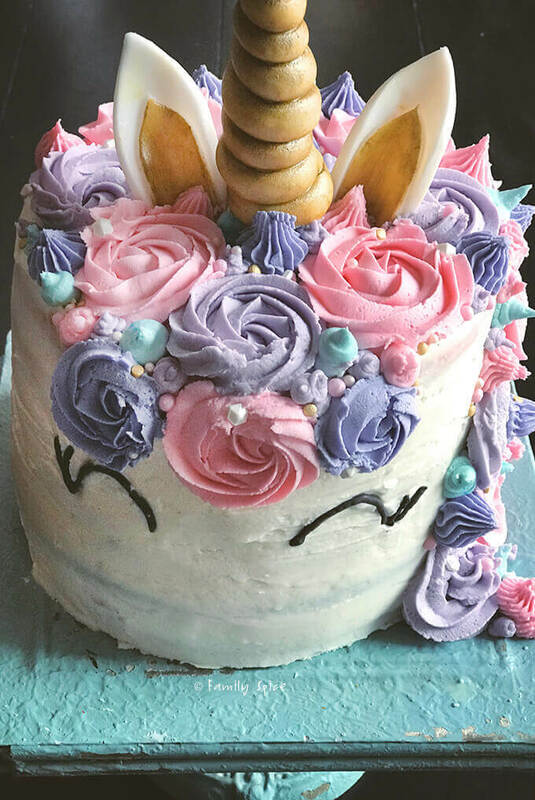 Keeping with my “keep it simple” philosophy in my not-so-simple task of recreating the infamous unicorn cake, I used store bought fondant to make the unicorn horn and ears. I have made marshmallow fondant from scratch. It is not a complicated thing to create, but it is time consuming. I bought my fondant from Micheal’s with my 40% off coupon. So remember, just because there are a lot of items to purchase for this project, between sales and coupons you can keep the costs down. Plus, I already had fondant accessories and piping supplies because I’m insane and semi-enjoy decorating cakes and cookies. You will need approximately 1/2-pound of white fondant for both the unicorn horn and ears. For the fondant unicorn horn, you need about a golf ball sized amount of fondant, some powdered sugar to keep things from getting sticky and a bamboo skewer. I rolled the fondant out on my silicone mat, but you can also dust a large flat work surface with powdered sugar and use that. 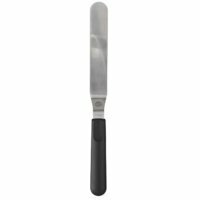 Roll out the fondant into a tapered rope of fondant about 19-inches long. This took about 5 different attempts before I got it right. You start by rubbing your ball of fondant between your two hands until you have a nice log forming. Then you roll it on your work surface using both hands, stretching it outwards as you roll to make it longer. Adhere more pressure on one end of the rope as you roll it back and forth to form a tapered end. Again, this takes some practice to get it right. If you don’t like how smooth your tapered rope is turning out, roll it back into a ball and start again. This is a fun project for your kid-helper. Remember, they have years of play-doh and slime experience behind them so don’t be surprised if they roll out a beautiful rope of fondant better than you! 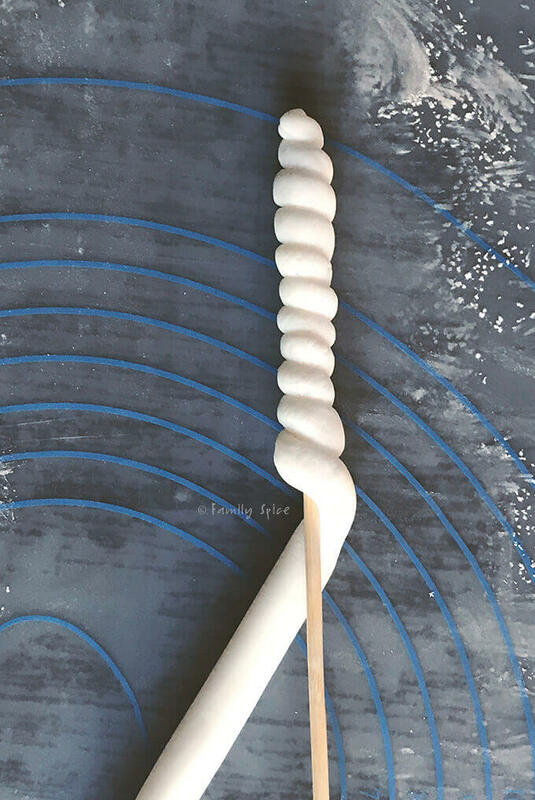 Once you have a tapered fondant rope that you like, it is time to make the horn. You will carefully wrap it around a bamboo skewer. 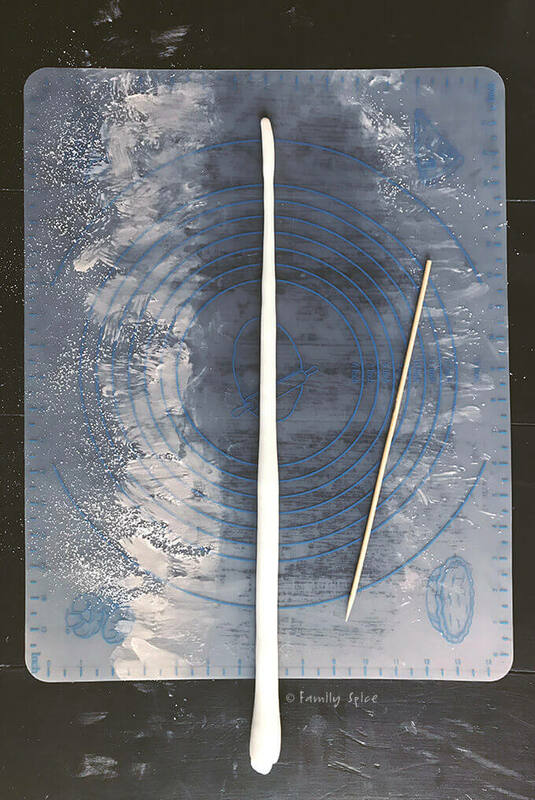 Starting with the thinner end of your fondant rope, wrap it around the tip of the bamboo skewer. Then continue to wrap it around as you work your way down the bamboo stick. The length of your fondant unicorn horn is up to you. Mine was about 9-10 inches long. Snip off the extra fondant when you get the horn to the length you like and tuck it into the fondant. Remember, you won’t really see this part of the unicorn horn as it will sit into the cake with swirls of unicorn mane frosting all around it. Stick your unicorn horn somewhere safe to dry out. It can be in a glass, a vase or in a big piece of styrofoam. I formed the fondant horn and ears before I painted them with edible gold. Oops! I’m getting ahead of myself again! After sweating it out with the fondant unicorn horn, I was ready for the much easier task of making the unicorn ears. Perky Rosanna used tear drop cookie cutters for her unicorn ears. That was one set of cookie cutters that I didn’t own, so I made my own unicorn ear template with paper (click here for the PDF template). You will need about a tennis ball size amount of fondant for the unicorn ears. Flatten the fondant on your work surface, again using powdered sugar to keep things from sticking. 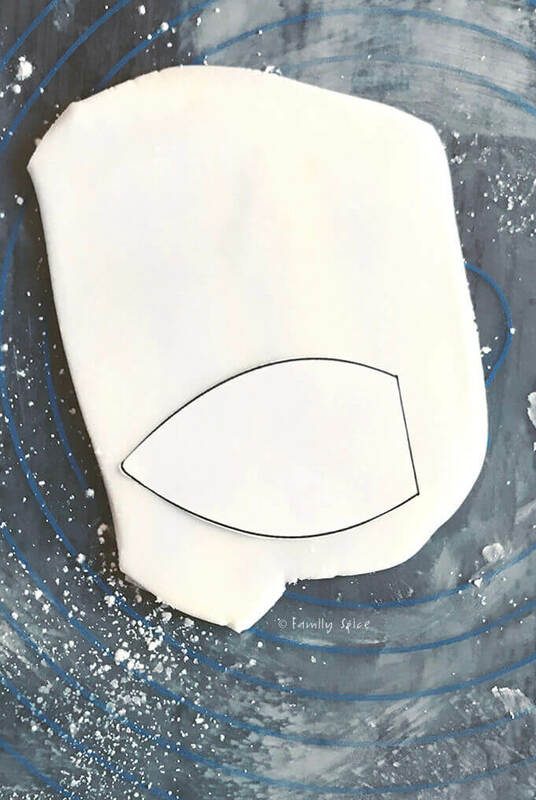 Roll out the fondant until it is about 1/8-inch thick. Cut out two large ears as well as two smaller inner ear pieces. Lighten moisten the back of one of the smaller ears with water and position it on top of one of the larger ears. The bottom of the ears should line up together on the straight end edge. Do not press the fondant too much as every indentation shows up. Simply smooth it out over each other. Repeat with the other two ear pieces until both ears are ready and assembled. The unicorn ears aren’t simply flat pieces of fondant sticking straight out of the cake. Instead, they are rounded. This is simple to recreate. Place each assembled ear over a small rolling pin or whisk handle, with the little ear facing down. Gently smooth the ear over the curve so the ears are curved together facing down. Place the ears somewhere safe from kids or nosey husbands and let it dry like this for an hour or even overnight. Once the fondant hardens, you can easily pickup the unicorn ears and they will keep this rounded shape on their own. Once the ears are hardened and hold their shape, they are ready to be painted gold. Once your fondant unicorn horn and ears have hardened a bit, I waited about an hour, it is ready for its golden moment. We are going for the gold, baby! Edible gold powder can be found both at Micheals and on Amazon. You don’t need much, so the smallest quantity you can find is perfect. Add a teaspoon to a small bowl with a few drops of vodka, peppermint or almond extract. The alcohol evaporates as the gold paint dries, keeping the gold adhered to the fondant. Use a brand new paint brush for this task, please. 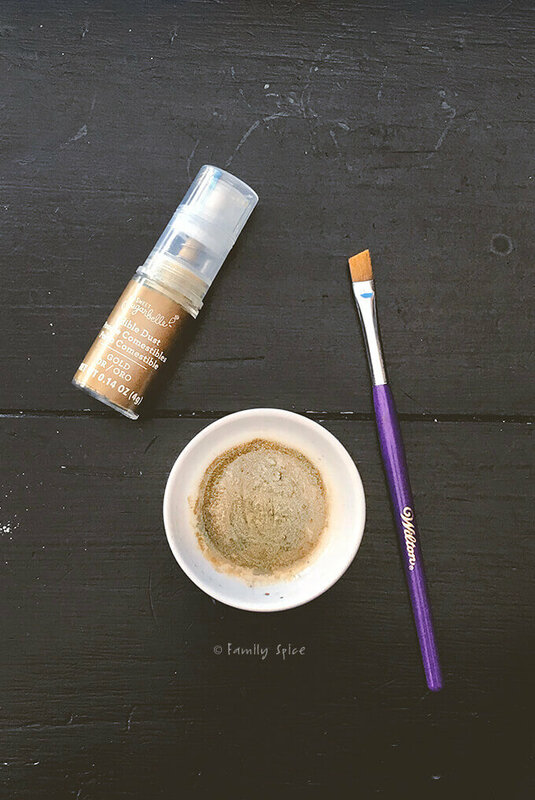 Any paint brush will do, as long as it has never been used. I keep a couple small paint brushes in my baking bin and only use it for culinary purposes. Simply paint your fondant unicorn horn and ears with the edible gold paint and let it sit for a couple hours (or up to overnight) to dry completely. I painted the entire unicorn horn and only the inner small ears gold for this step. You could roll out strips of fondant to make the eyes and eyelashes and paint them gold, too. But I found this to be super tedious and chose not to do the eyes in gold. I frosted the six rainbow layers of my unicorn cake with white frosting. You can use store bought canned frosting or make your own. 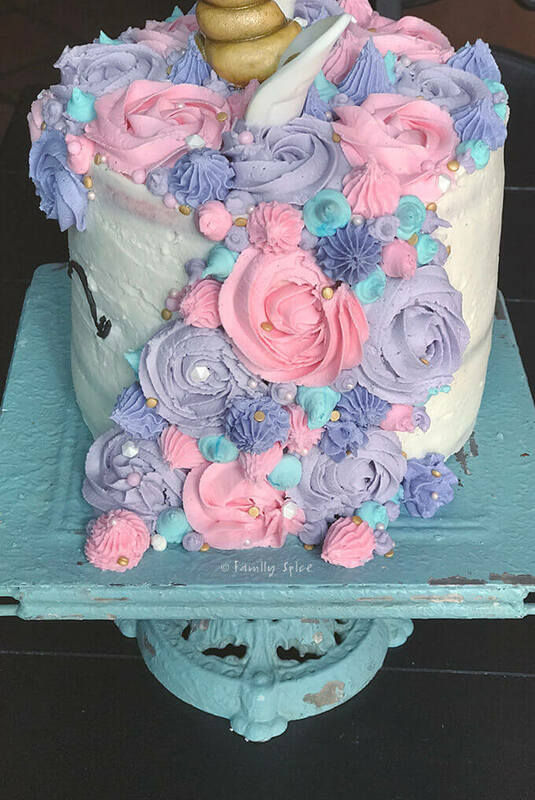 I used this recipe for all of the frosting (both the white frosting and the dyed) used in my unicorn cake. 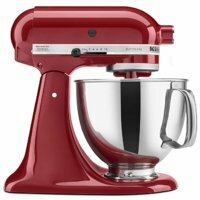 You will need approximately 6 to 6 1/2 cups of white frosting to frost just the basic white all over the six layers of cake. Since I had to pipe the unicorn mane all over the cake with additional dyed frosting, I made homemade buttercream. Homemade buttercream pipes better than canned frosting. You can also use Wilton’s already made buttercream frosting, which also pipes beautifully. Wilton gave me a few tubs for my kids’ cooking camp and my students really loved piping their cupcakes with it. You can see my halloween creations using Wilton’s frosting here. I used over 6 cups of frosting for the hair and it was plenty. I figure it is safer to have too frosting available than to run out because you have too little. Once the white cake was frosted, cleaned and beautiful looking, I placed it in the refrigerator and let it chill for an hour or two. I used this time to clean up the disaster of a mess I had made and to color the remaining frosting needed for the piping bags. I must have examined dozens and dozens of decorated unicorn cakes to analyze the mane that cascaded down the side of the cake. I ended up just winging it! I included multiple pictures of different angles of my unicorn cake so you could get a better idea of how I piped it. 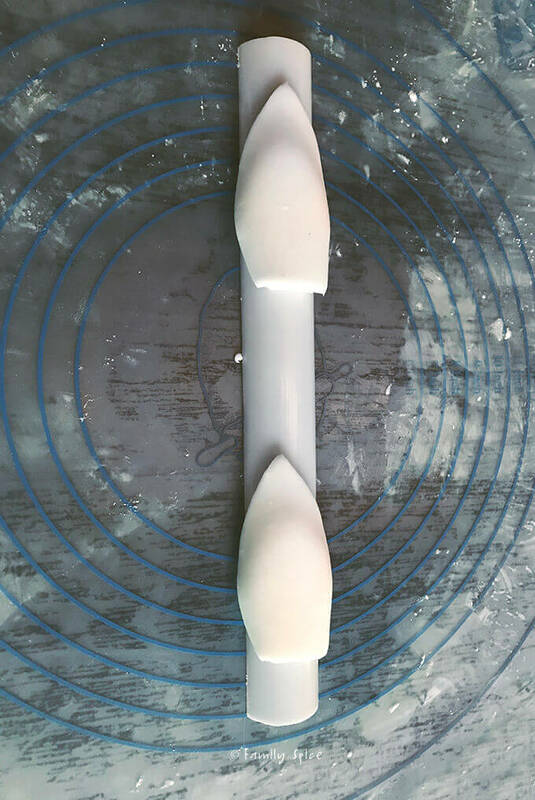 With the different sizes of piping tips you are using, it is best to start with the large swirls first, then medium, and fill in the gaps with the smaller dollaps of frosting. I started with the top of the cake first, filled it in and then worked my down the side of the cake. Take your time during this stage of the decorating process. You can add as much or as little swirls as you want. My daughter wanted an over-the-top unicorn cake, so we just had fun and went for it. Just to be clear, I piped in the entire unicorn mane first and then added the unicorn horn and ears to the cake afterwards. Of all of the parts to this unicorn cake, the one part that worried me the most were the eyes. Yes, those simple slits of the eyes. Despite what you think, I am NOT talented with piping cakes. Especially when it comes to piping on the SIDE of a cake. How would I pipe those simple curves to the eye slits using black frosting and not make a mess all over my beautiful white cake? I’m no Rosanna Pansino. I settled for some melted black candy melts that I had leftover from Halloween. I transferred the black goop into a small resealable bag and cut a corner off to make a little piping bag. My daughter drew out the eye slits on paper and we placed a sheet of parchment paper over it. She piped out several eye slits and we picked the best two for our cake. They were carefully transferred to the cake once dried and hardened. We also tried making the eye slits with fondant, but we found it was more tedious work. If you are comfortable with the piping bag, then by all means, pipe some black eyes directly onto the cake using a decorating bag fitted with a #4 tip. As I mentioned earlier, I piped the unicorn mane and hair before adding the horn and ears. I also had a slew of gold, white and pink sprinkles of various shapes because, well, I collect sprinkles of all kinds. When I showed them to my daughter, she loved the idea of adding them to the cake. Because unicorns are all about the bling, am I right? I positioned the fondant unicorn horn in the center of the top of the cake, at a slight angle pointing toward the front of the cake. I gently placed the fondant ears on either side of the horn, each placed at a slight angle pointing in opposite directions of each other. NOTE: If you don’t have much room in your refrigerator, you will probably need to add the unicorn horn right before you serve the cake. After that, the cake was done. My kitchen table was a disaster filled with frostings of all colors, sprinkles everywhere and piping bags thrown about. I was exhausted, my daughter was high on the bits of sugar she had been nibbling on while assisting me, and I happily placed the unicorn cake in the fridge until the party later that night. So this unicorn cake with the six rainbow colored layers was definitely not for the faint of heart. It took two days to make and assemble. It took gobs and gobs of frosting to decorate. I spent several nights lying awake thinking about each aspect of decorating this cake. I really am all thumbs with the piping bag and I was afraid I had over-promised my daughter when I said I could make this unicorn cake. But, her face said it all. She loved the cake. Her friends loved the cake. My daughter and I can now laugh about making this cake together. She ate the golden fondant unicorn horn the following week – ack, gross, right?! If this unicorn cake seems to daunting for you, why not try your hand at unicorn cupcakes? This version uses ice cream cone tips for the horn (I thought they looked like those bugle snack chips!). I love the simplicity of this version which uses fondant. 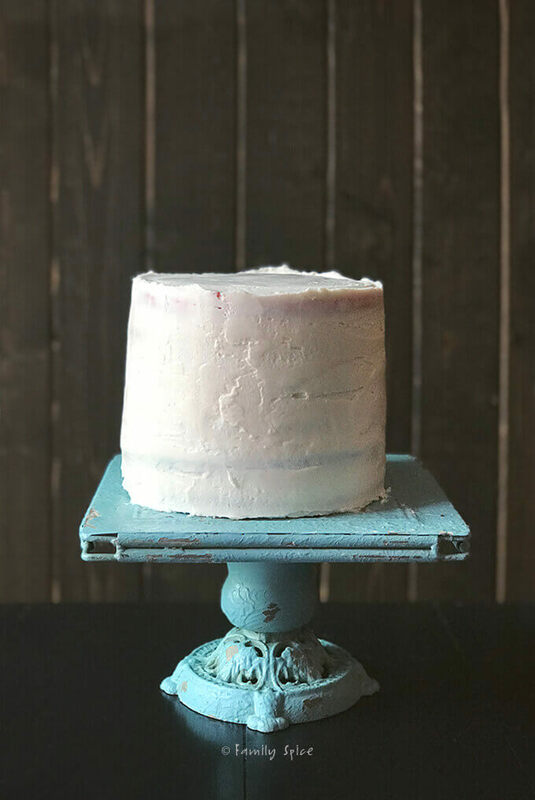 And for those of you with gluten allergies or sensitivities, try this Gluten Free Unicorn Cake (gluten free strawberry cake) from Fearless Dining. A bit overwhelming? I wrote a post about cheap and simple birthday cake ideas here in my birthday cake roundup post. 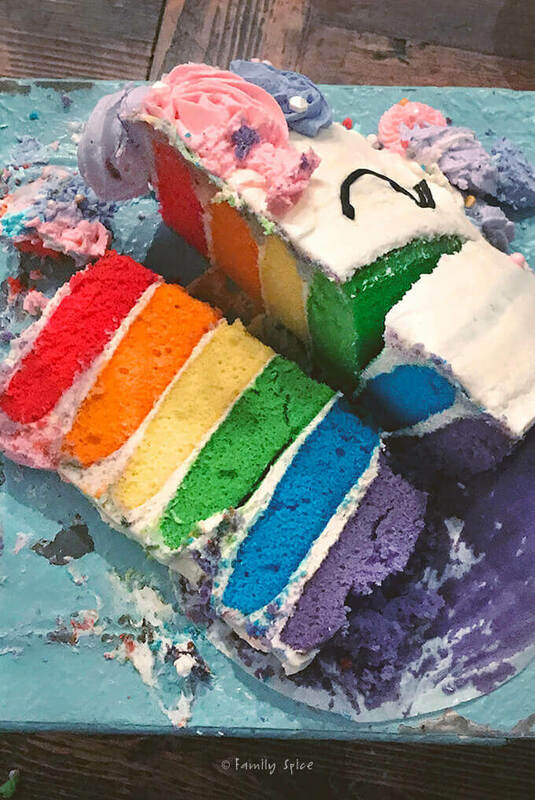 I was too busy slicing up the cake for my daughter’s friends that I didn’t have an opportunity to take a pretty picture of my rainbow layered unicorn cake sliced open. I really should remember to shoo everyone away while I slice up cakes just so I can sneak a picture. Instead, enjoy this shot of what was left AFTER I passed out the cake slices! 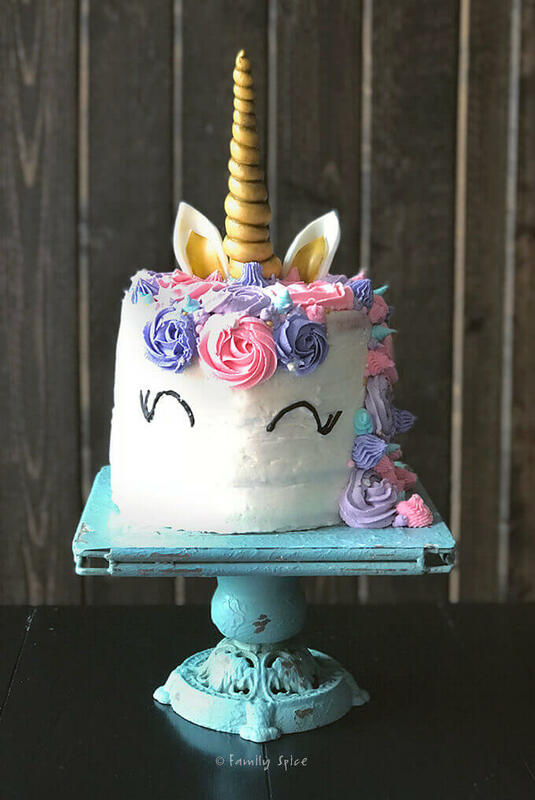 If you are looking for something less labor intensive for your next birthday party, I have a list of fun and easy birthday cakes that are budget friendly and require less skills than this unicorn cake to assemble! And if you have any questions about the process on how to make a unicorn cake, please leave a comment below. Brighten up anyone's birthday with this 6-rainbow layered unicorn cake with golden fondant unicorn horn and ears. Place mixing bowl on kitchen scale then zero out scale. Mix up one box of white cake batter per package directions into mixing bowl. Weigh bowl with white cake batter mixed and ready. Divide this number by 3 and divide batter into three bowls. 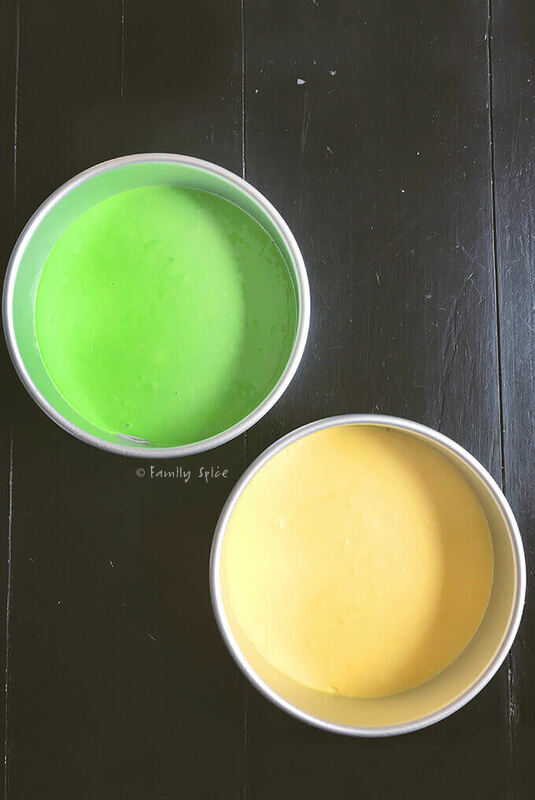 Dye each bowl of cake batter into desired colors. I used red, orange and yellow. 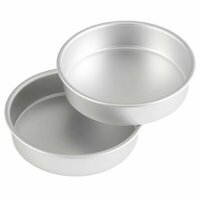 Transfer batter into 3 8-inch cake pans, coated with oil and lined with parchment paper. Bake cakes until toothpick inserted into center of cake comes out clean, about 20 minutes. 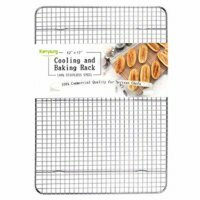 Let cakes cool completely on wire racks. While cakes are baking, clean bowls and prepare second box of white cake batter per package directions into mixing bowl. Divide batter evenly into three bowls and dye each batter into desired colors. I used green, blue and purple. Do not begin frosting the cake until the cakes are completely cooled. Stack cakes on a cake stand, layering in white frosting between each layer. Frost and smooth out entire cake in white frosting. You will use approximately 6 cups of frosting. Use white fondant to make a unicorn horn (detailed instructions in blog post). Wrap it around a bamboo stick and let it harden. Roll out remaining fondant until 1/4-inch thick. 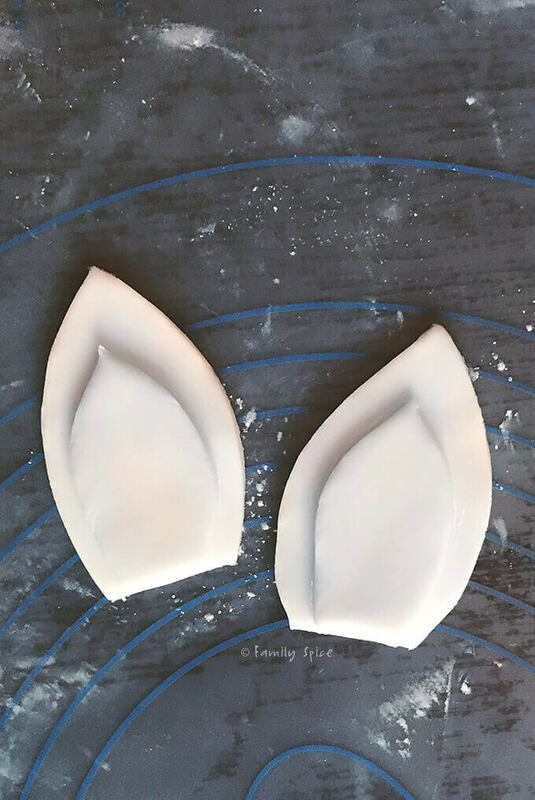 Use teardrop cutters or template I provide (link in blog post) to cut out 2 ears with 2 inner ear pieces. Mix a few drops of peppermint extract into edible gold dust and then brush it onto the horn and paint the inner ear gold. Set aside to dry completely. Pipe rosettes on the top and along one side of the cake using the pink and light purple frostings using the #824 tip. 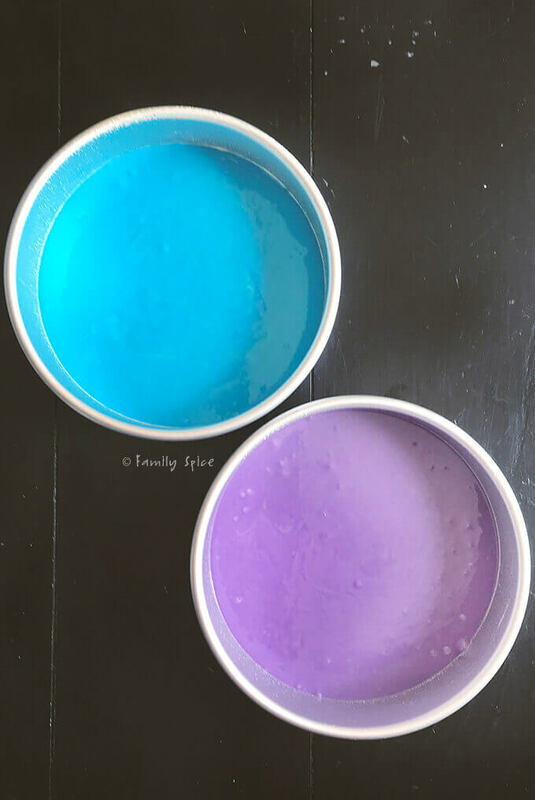 Add dollops of pink and dark purple frostings using the #4B tip and the blue and dark purple frosting each fitted with a #2A tip. Pipe eyes onto the front center of the cake using black frosting and the #4 tip. Place horn on the top center of the cake and the ears on either side of the horn. Sprinkle around the cake with assorted gold, white and pink sprinkles.